Most mornings I wake up with some idea....an inkling at least of what we'll have for dinner. This day I had no idea. I opened the fridge, the cupboard......nothing. I opened the freezer......spanish rice from a few weeks ago. The same thing I do with every other left over ingredient.....throw it in soup. And so this soup was born....and it's kind of one of those things that really does work with whatever you may have lying around. Left over chicken? Throw it in. Corn tortillas....yum! Let this soup be your canvas. Saute' onion in a bit of olive oil until translucent--about 5 minutes. Add garlic and chipotle flakes, and cook for about 2-3 minutes. Simmer for a few hours--the soup is officially "done" as soon as it's hot, but I like to let soup simmer for the afternoon so all the flavors can play together for a while. Top with cilantro, your favorite tortilla chips, and a squeeze of lime. sounds delish! love the new header!! That is one gorgeous soup! This looks so delicious! 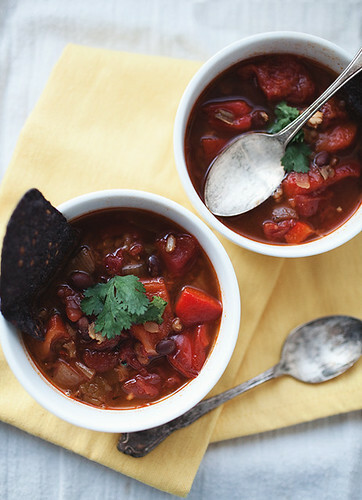 I've been wanting to make black bean soup lately and I like that this one is little step up from just plain beans. Can't wait to try it out! Thanks for sharing this recipe. I am going to give it a try. My family goes through a lot of beans and I am always looking for something new. We made this for dinner the other night and LOVED it! We decided we want to try it again and add corn and ground beef so it's just like a taco soup. Thanks for sharing! Thanks for this healthy post. If you are really concerned about your health then you may take help from the noni fruit juice. Women may take the women's choice noni juice that can help them in maintaining normal blood sugar and blood pressure level. This can also help you in maintaining good health as it is a natural antibacterial and anti-oxidant.